✔ICICLE product is of high and reliable quality but maybe plagiarized by others. In the interest of you and us, Plz double checking you are making purchase in Icicle online store, we can't guarantee the quality of fake products otherwise. If you spot the words"NEW FROM"on the right side of the Pics, click to enter the purchasing page, where you can choose Icicle direct to place order. If you have received a counterfeit product, actions should be performed: Contact Amazon and us! ✔EASY TO USE: 2 switch buttons to control; One for power, another for 8 modes choose. ✔AUTOMATICALLY: Put under sunshine during the day, and it begins to light up at night automatically when power on. ✔LONG WORKING TIME: Continuously working for 8 hours at night with once single fully charged. 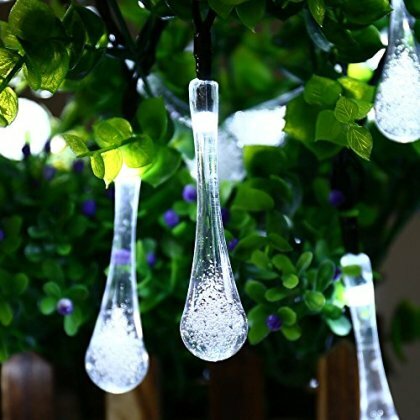 ✔BEST GIFT FOR OUTDOOR DECORATION: Special water drop appearance makes your environment looks out of ordinary.